Last year during King Tides, the City experienced multiple road closures due to flooding. This year, in the areas where roads have been raised and stormwater pumps installed, roads remained dry. In a letter to residents, Mayor Philip Levine said “it’s business as usual in Miami Beach.” The Mayor noted the City prepared well for what were expected to be even higher than usual tides due to a supermoon – when the moon approaches its closest point in its orbit around the Earth. This month, the moon was the closest it has been since 1948 (and will not be again until 2034). The gravitational pull of the moon is a major factor in tidal fluctuations. Additionally, the Mayor said, the City utilized temporary water dams and pumps in other areas where projects have yet to be completed. While roads remained dry, the effects of King Tide were still felt up and down the Beach. 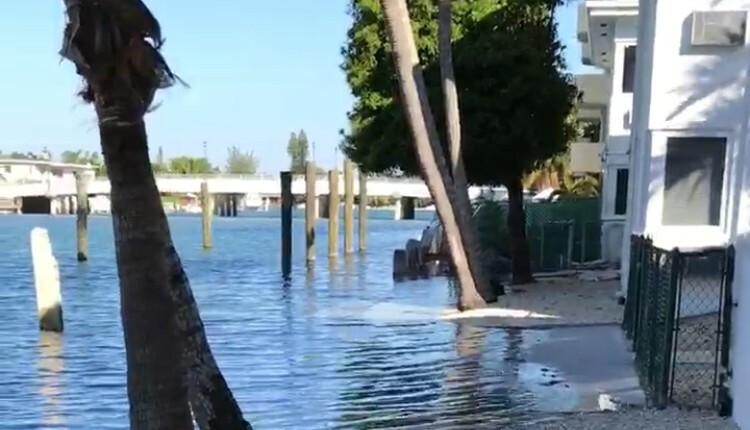 Water lapped at buildings in North Beach (see photo above), while Richard Conlin posted photos to Facebook of an octopus ending up in a parking garage on West Avenue in South Beach. An unintended casualty of the City’s resiliency efforts: Sardinia Ristorante in Sunset Harbour. The restaurant, located in one of the lowest points of the Beach and the first area to get the raised roads and pumping stations, was initially denied on its insurance claim for damages experienced in an October flood due to heavy rain. The insurer – Allstate – determined the restaurant was now located in a basement area given its relationship to the raised road in front of it. Allstate offers the policies under FEMA’s National Flood Insurance Program and must abide by the Federal regulations set forth by NFIP. The adjuster, who had never seen elevated roads and stormwater pumps, determined Sardinia qualified as a basement location under NFIP guidelines. City staff worked with Allstate’s Flood Department manager and FEMA NFIP staff, which ultimately agreed that Sardinia is not located in a basement area and should appeal the denial of its claim. While the shorter-term issue appears on its way to working itself out, it also becomes a longer-term issue for the City, businesses, and property owners to be aware of as additional roads are elevated.